I will admit it: I am somewhat obsessed, and scared, about the seemingly never ending saga of what is going on in the financial sector in Europe right now. The reason is frankly that there is a reasonable chance there will be a dramatic meltdown in Europe that will deliver the world economy a substantial blow, affecting our businesses and our personal finances. I have always found supply chain professionals are very interested in what is going on in the economy. Whether that is for personal or professional reasons I am not sure, but we know that what our supply chains need to do at any point in time is highly dependent on economic conditions. Despite those high rates of recent quarterly production growth, did you know that total US industrial output is about 3% below its 2007 level? So back to my concern with Europe. To those that do not follow this, individual countries such as Greece, Spain, Italy and others are struggling to manage their high levels of debt and rising interest rates on that debt. They can't print money to deal with this predicament, as has often been the case in the past, because a country can’t print its own money with a common Euro currency. They also can't just default on the bonds they created because European banks own most of those bonds, and a default would take those banks under. It is a total mess. Just watch CNBC for a few hours on any given day and you will see a wide variety of opinions, from looming Armageddon to manageable challenge if Germany just finally agrees to bailout Greece, Spain and others. Many think it won't. Personally, I believe this is not going to end well. I am praying it doesn't conclude as badly as the Lehman Brothers crash did here in 2008. Not to be the bearer of bad news, but some think this will lead to a major depression in Europe that will infect the global economy - maybe as soon as this summer. This threat is very real! Get on top of it personally and professionally. This really is a supply chain issue as well. Most of Europe is already in recession, confounding previous demand forecasts and hurting US exports – and Chinese exports even more. A recent article in the Wall Street Journal noted that US companies are already reacting. They are changing supply contracts to US dollar terms, for example, protecting against the falling Euro value and even worse, some countries potentially leaving the Euro for their own currencies that would hold just a fraction of the Euro value. Many are shortening payment terms to further reduce risk. And make no mistake, the global economy is slowing. 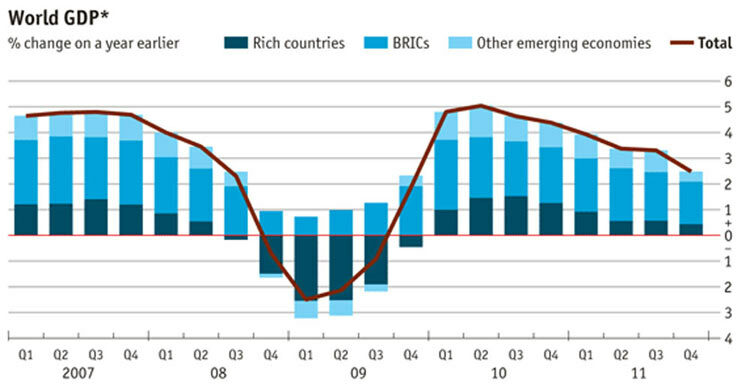 As can been seen in the graphic below, global GDP is decelerating. This chart goes through the end of 2011, the last global data I can find, but Europe has gotten worse since then, and formers high flyers China, India and Brazil all reported much weaker than expected growth so far in 2012. US GDP growth is positive, but much weaker than almost every previous recession. As shown in the graphic below, GPD growth here has also slowed since 2011. We have lately seen GDP growth below the long term rate of 3.4%, and well below the usual post-recession growth levels of 4-8% that enable the average rate to be 3.4% when including recession periods of negative growth. In the US, manufacturing has been a bright spot. As shown in the chart below, manufacturing growth has in general come in at much higher levels than the overall growth in GDP. That is the good news. But it masks how bad things really got during the depths of the recession. Despite those high rates of recent quarterly production growth, did you know that total US industrial output is about 3% below its 2007 level? It has to do with the mathematics that if your stock investment drops 50%, you have to see growth if 100% from there to get back to where you were. One bit of very good news is that US capacity utilization continues to rise. As shown in our supply chain graphic of the week, capacity utilization in April rose to 79.2%, just a hair below the long run average of 80.3%, and well above the bottom of about 65% in June, 2009, the lowest level since the Great Depression. The result of all this has been a flight to the dollar. Incredibly, 10-year treasury notes fell below 1.5% interest rates this week. To put that in perspective, if you were lucky enough to have $10 million in cash, you would make a whopping $150,000 in interest income a year from US treasuries. Wow. Two-year bonds pay essentially zero interest. In Germany, two-years have negative interest - you have to pay Germany to lend it money. That means inventory carrying costs are cheap. Might be worth bulking up inventories that can boost sales revenues right now. At least look at that question anew. Despite huge piles of corporate cash, merger and acquisition activity has slowed to a crawl. Don’t plan on being bought or sold any time soon. The weakening global economy, especially in China, combined with the rising value of the US dollar, has led to a collapse in oil commodity prices. Oil is down below $84.00 right now, 20% below where it was just a few weeks ago. Most other commodities are down similar levels. If was me, now is a great time to use hedging strategies to lock in lower input costs. All I can say is, keep your helmet on. I think it is going to be a tough summer. Any comments on our summary of the supply chain economy? What should companies do right now? Let us know your thoughts at the Feedback button below.